Today on the Doc On The Run podcast we’re talking about peroneal tenosynovitis in runners. Before I forget I want to mention that at the bottom of the show notes page for this particular episode you can get clear instructions on the simplest ways runners can treat this condition at home. If you are listening to this, you’re probably a runner and you probably also have pain on the outside of your ankle. You may have already been to see a doctor, or you may just be trying to figure this out on your own. Either way, either you or someone else has suggested that you have a problem with the peroneal tendons. And you’re probably worried that it’s going to screw up your ability to run at least for the next several weeks. Your doctor may have told you, or you may have read, continuing to run with peroneal tendinitis can result in permanent damage to the tendons. So a diagnosis of peroneal tendinitis can and should be concerning. Peroneal tenosynovitis, Peroneal tendinitis, Peroneal tendon tears, they all affect the peroneal tendons. But they are different problems! In the overwhelming majority of cases runners are told that they have “peroneal tendinitis.” But fortunately that’s not always true. Problems with the peroneal tendons have a full range of difficulties. 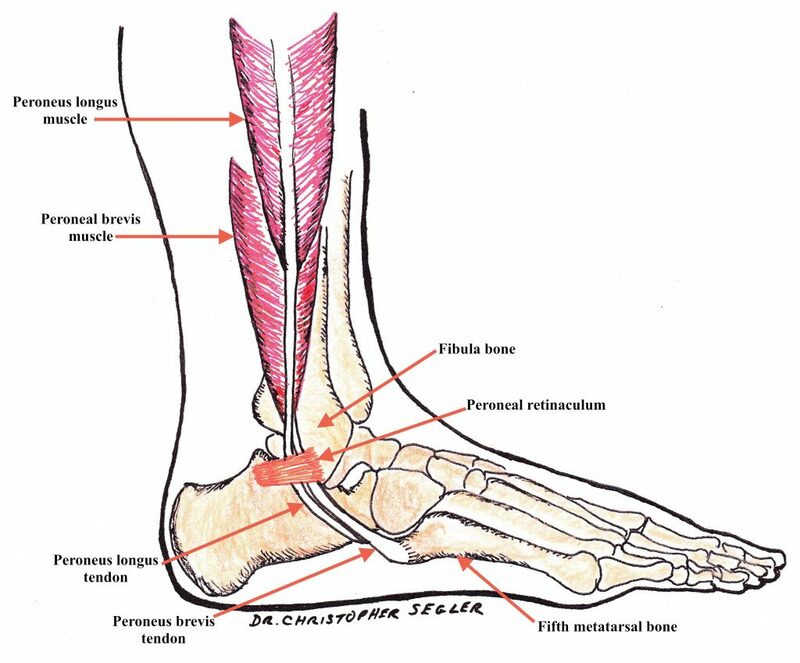 We touched on this in the overview of peroneal tendinitis. The most important thing is to figure out whether or not you actually have peroneal tendinitis or you have another condition that might be easier to treat, like peroneal tenosynovitis. Let me give you an example. My own personal peroneal story is really a classic tale, similar to stories I have heard from patients I have treated on many occasions. What happened me I was using Newton running shoes for speed work and for races. If you haven’t run on those before you have to understand that they have these protruding lugs under the forefoot that help you run as a forefoot or mid foot striker. One thing that is great about Newton running shoes is they seem to really help you build more peroneal strength. But if you’re not used to running on them, and your peroneal muscles are weak, you can get an overuse injury if you ramp your mileage up too quickly. I had finished one Ironman race earlier in the season. After that race, I quit running in the Newtons for a few weeks. I was getting ready to do Ironman Florida. The race was only about a month away. It suddenly occurred to me that I needed to get used to running in the Newton running shoes more consistently before using them for Ironman Florida. So I decided to run in the Newton running shoes that weekend for my long run. This is one of those classic ways runners make mistakes. I knew it would be a bad idea to run a long way in shoes I wasn’t accustomed to. However, I justified it by telling myself I was going to run with one of a friend who talks a lot. Since I figured we’d be running and talking would be running relatively slowly. But it was a long run. In fact it ended up being a 16 mile run on rolling terrain. 16 miles of hills is not a good way to break in a pair shoes. The next morning I woke up and stepped out of bed. I had pain in my left foot. I looked down and I had an enormous bruise on the side of my left foot and ankle. Bruising is the worst possible sign when you’re runner. If you get a bruise it means that you have done significant damage to the tissue. You did enough damage to cause bleeding under the skin. That means you either broke a bone, ripped a muscle, split a tendon, or tore some soft tissue structure enough that it had to bleed. So there I was sitting on my back porch drinking coffee staring at this bruise wondering how I was going to get better in time for Ironman Florida. To be completely open and truthful about it, I was worried. Very worried. Several times a year I am invited to speak at medical conferences to teach other physicians about how to treat complicated running injuries, identify subtle fracture patterns in runners and teacher podiatrists, foot and ankle surgeons, and sports medicine doctors about running biomechanics. I can tell you with 100% certainty if I described my case at one of those conferences, to a room filled with doctors, virtually every physician in the room would say that I had to wear a fracture walking boot for six weeks. The base assumption from most doctors would be that pain coupled with that amount of bruising suggested either a bad stress fracture or a torn peroneus brevis tendon. Since I did not have any pain at all when I did my usual self-diagnosis routine and checked my foot for a metatarsal stress fracture, and only I had pain when I was pushing on the peroneus brevis tendon, that really only could suggest a peroneus brevis tendon problem. I think most doctors would say I should use fracture walking boot for six weeks. After six weeks if the problem has not resolved then it would be time to get an MRI to see if there was an actual split or tear in the peroneus brevis tendon. Since I was only four weeks out from Ironman Florida, obviously this routine was not going to work with my schedule. So I figured it was time for drastic action. I iced the foot like crazy. I even submerged it completely in ice water. And it started improve. I also quickly realized that if I were walking around the house in running shoes instead of barefoot, I didn’t have that much discomfort. Since I always have fracture walking boots to give to patients when I see them during a house call, I decided I should use a fracture walking just to really let it calm down immediately. So I iced it, I wore compression socks and a fracture walking boot 24/7. 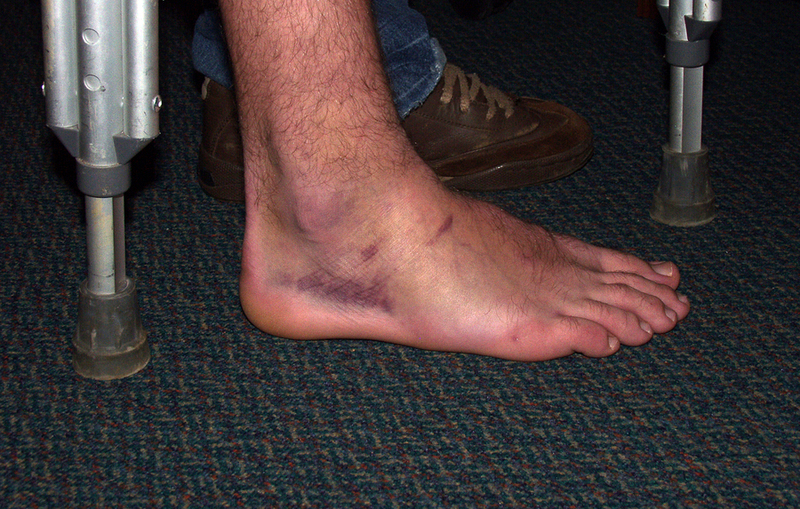 The next morning, I could walk in the fracture walking boot with no pain whatsoever. Within a couple of days, even though the bruise was still there, I could push on the peroneus brevis tendon and move my foot in a way that had to activate and fire the peroneus brevis tendon, and I had no pain. No pain is a very good sign. To make a long story short, I did Ironman Florida and had my fastest race ever. The instructive part of the story for you listening to this today is that it didn’t take six weeks to heal. In fact it only took a few days to heal with that particular routine. And what that really means is that I could not have had a stress fracture. I could not have had a split in the peroneus brevis tendon. I also could not have had a true case of peroneal tendinitis. They just don’t heal that quickly. I only had a case of peroneal tenosynovitis. Only tenosynovitis could heal that fast. Peroneal tenosynovitis is simply inflammation of the sheath that surrounds the peroneal tendons. The two peroneal tendons are on outside of your ankle as they curve down behind the back of the fibula bone and head out to the foot. When they go around that curve behind the fibula bone there’s a lot of friction. To reduce that friction the two tendons are surrounded by a tendon sheath. The tendon sheath is tough and fibrous on the outside. But on the inside it’s lined with soft, squishy synovial tissue. The synovial tissue makes the synovial fluid which lubricates the peroneal tendons as they glide back and forth through the tendon sheath. The outside of the tendon sheath is tough. It’s sort of like a garden hose. A garden hose is tough and when you turn on the water the hose doesn’t expand or blow up like a balloon. So when you have swelling inside the tendon sheath, instead what happens is that squishy synovial tissue on the inside of the tendon sheath swells inward. That swelling decreases the internal diameter of the tendon sheath. But the size of the tendons isn’t going to change. The peroneal tendons are just like cables made up of collagen. You can’t squeeze them and make them smaller. The reason it becomes painful when you have peroneal tenosynovitis is that the two tendons are sliding back and forth, squeaking their way and squeezing their way through this tender, swollen and inflamed synovial tissue. And it hurts! If you ignore this problem it won’t calm down. Every time use take a step, every time you push off when you run, every time you absorb shock when you land and your tendons move back and-forth through that swollen tendon sheath, you are irritating the synovial tissue. Even if you’re as strong as an ox and half as smart ignoring the problem, Just because you’re tough is not a good idea. 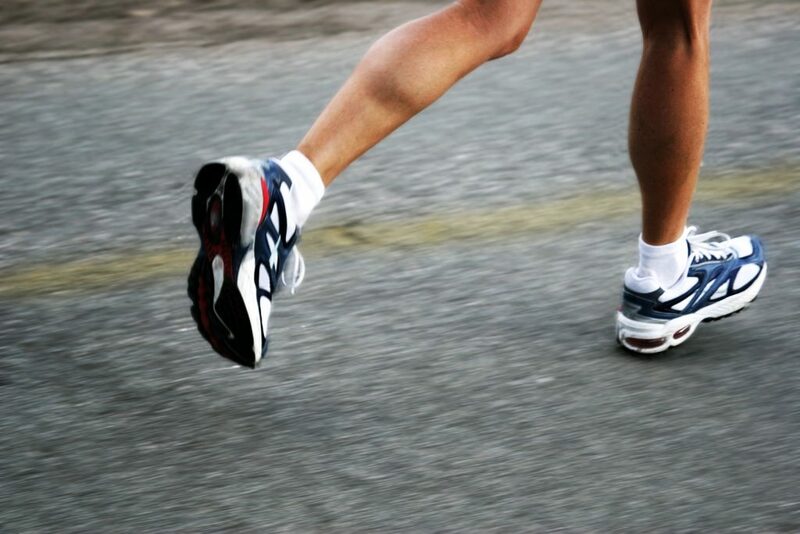 If you keep running and ignore the pain, you will have inflammatory fluid trapped within the tendon sheath. That inflammatory fluid then bathes the two peroneal tendons in degradative enzymes that actually degenerate a college making up the tendons. Over time, the collagen becomes damaged and weaker. You start getting micro tears and a condition known as tendinosis. The tendons get thicker. They take up more space. The increased diameter of the tendons further irritates the synovial tissue. And eventually, if ignored for long enough, one or both of the tendons will tear. And don’t be confused. This does happen. I actually did surgery on a runner four days before he was supposed to do a marathon. He had two splits in his peroneus brevis tendon and a tear in his peroneus longs tendon as well. All of that happened just because he continue to ignore the pain and continue to run. I would be willing to bet all of his trouble began with a simple case of peroneal tenosynovitis. But don’t worry, there is good news. Peroneal tenosynovitis is actually pretty easy to treat in its early stages. “-itis means inflammation. So this is really just a simple case of information that has to go down. You have to protect the tendon sheath. 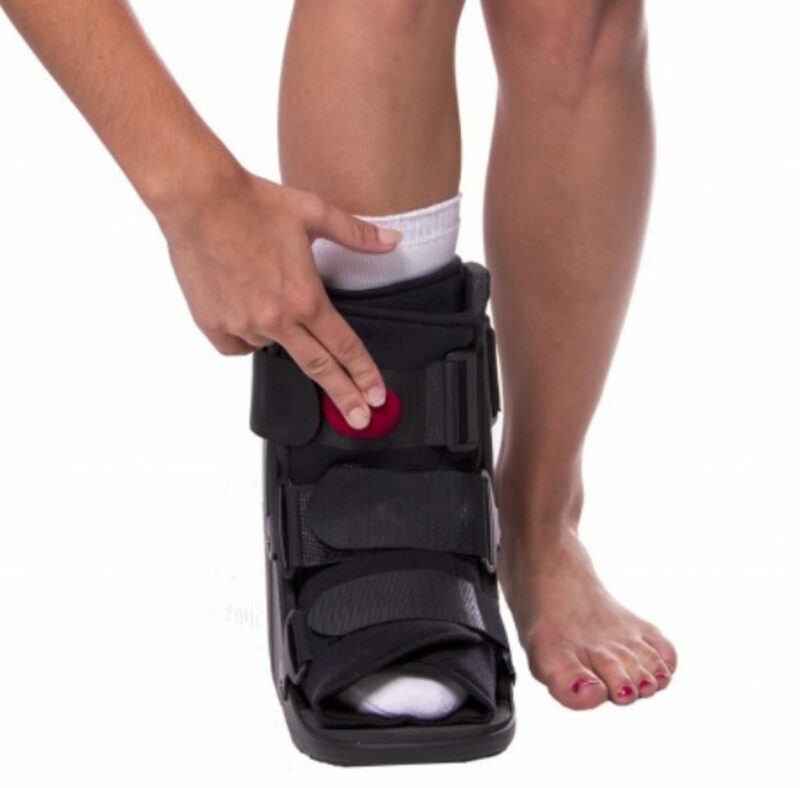 Although a fracture walking boot or a cast will certainly protect the tendon you don’t always have to use something so drastic. If you walk around in stiff supportive hiking boots you may be able to protect the tendons as much as if you’re using a fracture walking boot. You could even try supportive lightweight hiking boots or trail running shoes. The basic idea is you want to try to use something that is more supportive than the shoes you were wearing when you sustained the injury. You don’t have to completely immobilize it in most cases. You just want to make sure they provide enough support to calm the tendon sheath down. Most doctors recommend strict rest. They tell you to quit running. They tell you to stop all activity. When it comes to runners I always recommend relative rest not strict rest. Obviously if you were running on trails or on loose sand when the injury occurred you want to stop doing that. But you might still be able to ride a bike or even run on a flat predictable surface without pain. You just have to get enough rest to allow the tendon to heal. But it doesn’t mean you have to stop all activity. Ice may be the most effective way to decrease the inflammation. Because the tendons in the tendon sheath are relatively close to the skin it might help if you just apply and ice pack. But if you really want to shut off inflammation as quickly as possible you should do the contrast bath routine. Just go to the podcast show notes page for this particular episode and I will email an instructional video that shows you exactly how to do the contrast bath routine. I’ll also send a couple of other helpful episodes to you so you know exactly how to keep healing. When you look at your foot and you can see it is swollen you have too much fluid in the tissue. This is part of inflammation. If you squeeze the tissue it pushes the fluid out. You need to use compression to help push the fluid out. You can use an ace wrap or you can use compressive socks. If you’re a runner you may already have some knee-high compression socks. These work great. Just make sure the foot section is also providing compression. Some of the new compression socks are supposed to be more comfortable because the foot section feels more like a regular running sock. You need to ones that feel tight all the way from the toes to the knee. If you sleep in a compression socks for the first couple of days it’ll really push the fluid out quickly. If you want to get the fluid out as quickly as possible get your feet up in the air. They have to be up above your heart. If you’re sitting in a chair if your foot propped up next to you, you’re not really elevating. Your foot has to be up above your heart. The higher up the better. If you can, lay down on the floor and put your feet straight up the wall. This is actually a yoga pose known as “legs up the wall pose.” If you do this while you’re wearing your compression socks it will really accelerate the drainage process. The more the things you do the faster it will heal. Keep in mind that Gary did a lot of these things to decrease the stress to the tendon and decrease inflammation said he could get better as quickly as possible. So if you or a runner and you just started having pain, and you suspect is peroneal tenosynovitis the solution is pretty simple. You really have a couple choices. Go to the doctor, sit around all day, spend several hundred dollars and get x-rays that won’t show anything. Let the doctor tell you that you have to wear fracture walking boot for six weeks. I can assure you that wear a fracture walking for six weeks it will calm down peroneal tenosynovitis fairly reliably. But the cost of wearing a fracture walking boot is really high when your runner. You just can’t afford that level of loss of fitness, weakness and ankle stiffness. You just wind up with other problems later. Call a running injury expert like me directly to have a phone consultation or a Skype consultation to help walk you through the options and explain all the details to you. I do these sort of remote consultations for athletes all over the world. But the truth is most runners don’t even need that. The fact that you’re even listening to this tells me that you’ve already started searching for solutions. And if you’re searching for solutions you can understand the difference between these conditions, even without my help. Do your own self-diagnosis and self-treatment and see if you improve. Again, just like in my case and in Gary’s case as well, we both got better with really simple treatments, after a very short period of time. And within just a couple weeks Gary did a marathon. I had my fastest Ironman ever four weeks after developing peroneal tenosynovitis. All because I did simple treatments right away. If you try to treat the condition on your own and it doesn’t improve you can still either go see your own doctor or call me for a remote consultation. In either case, it will be helpful to know how you responded to those simple treatments. Peroneal tenosynovitis is just inflammation inside the tendon sheath surrounding the tendons. It’s just soft tissue inflammation. It heals really quickly and responds pretty effectively to very simple treatments. If you try all the simple treatment and you remove the inflammation but you’re not getting better, then it may be actually a case of true peroneal tendonitis. Peroneal tenosynovitis will usually dramatically improve after just a few days of doing the contrast bath routine, decreasing activity and wearing compression socks. So you have to keep that in mind whenever a doctor tells you that you actually have peroneal tendinitis. I really believe that many doctors over-diagnose the problem and condemn patients to a much longer period of immobilization, inactivity and no running than is necessary. The bottom line is unless you’ve had an MRI, or unless you’ve already tried to treat it the way you should treat peroneal tenosynovitis, you can’t really say for sure that you have a worst-case scenario like peroneal tendinitis or a tear in one of the peroneal tendons. Those are worse problems. But they’re much less common in runners than peroneal tenosynovitis. The key with treating peroneal tendon injuries is to make sure that you know exactly what the problem is. Then you want to treat it as quickly as possible. You also want to make sure you maintain as much activity while you continue to heal. Don’t just lock yourself up in a boot for weeks if you don’t really need it. Don’t stop running unless it is really required to heal. There’re many different forms of peroneal tendon injuries and they’re all different severities. We don’t all get the same condition and we don’t all need a fracture walking boot for six weeks. Not only that, but everybody heals differently. 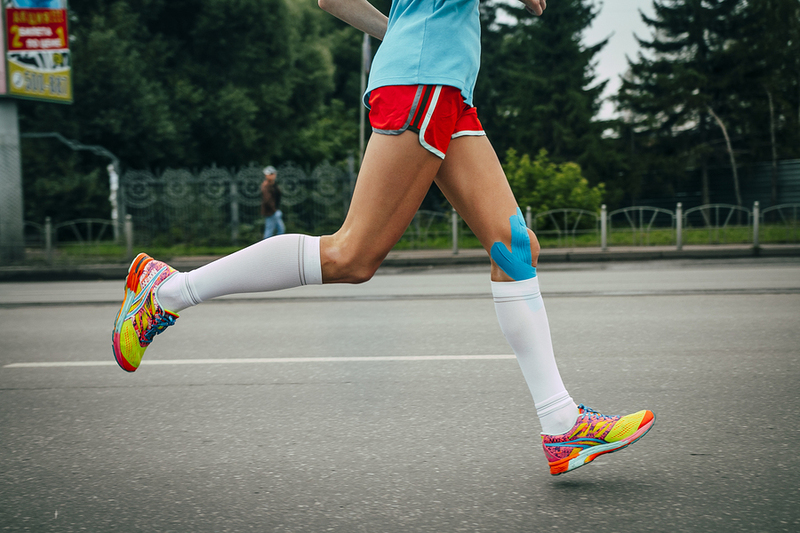 As a runner, you really have to make sure you’re getting the most appropriate treatment for you, with your potential to heal, with your particularly injury and in a way that we’ll help you maintain your fitness and keep on track with your running goals. As soon as you quit driving, as soon as you get off your exercise bike, or as you get done listening to this, go to DocOnTheRun.com, go to the podcast show notes page for this episode and I will show you exactly how to do the contrast bath routine and exactly how to keep healing. It’s all free…all you have to do is enter your email I will send it to you.